On Jan. 13, 2014, the fourth annual Martin Luther King, Jr. Celebration, a commemoration of MLK through a variety of educational and inspirational programs and community service opportunities, began with its Coming Together to Fulfill the Dream opening celebration inside the student ballroom. At the event, multiple speakers and performances were present to celebrate the dream of MLK and to address the importance of overshadowing diversity with unity. Overall, the entire celebration involves more events for the month of January that extends from speeches, entertainment, tours and remembrance. 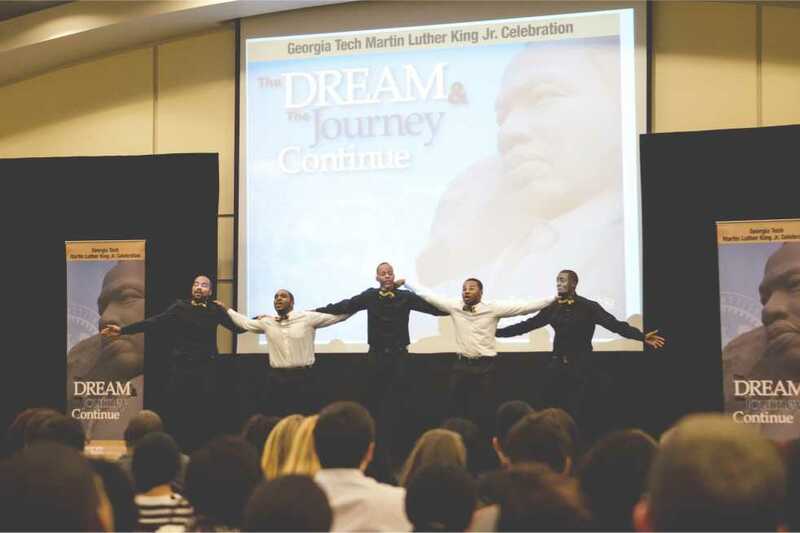 “The purpose of the MLK events is to commemorate the continuing dream and vision of Dr. King and help propagate the dream, which is highly applicable to our society today, across Tech and the Atlanta community,” said Co-Chair MLK Celebration Anuraag Bahl. After the opening event, the celebration continued with a Hotel Rwanda movie premiere, which displayed the true story of a hotel manager, Paul Rusesabagina, who housed thousands of victims of the Rwanda genocide, and followed the day after with a speech from the Rwandan ambassador, Eugène-Richard Gasana, who spoke about his experiences with Rwanda, the legacy of MLK, and the significance of unity. The ambassador explained and called on various means to improve the society and culture that we live in. He then called on the audience and society to reach out to those in need and peacefully work together to overcome oppression and injustices. The MLK celebration will continue this month with other events, such as the FOCUS Program for prospective minority graduate students, the National MLK Holiday Observance event for community service projects, the Sunday Supper: A Community Conversation & Meal to reflect on MLK and a Civil Rights Tour in Memphis, Tennessee. Some events have limited spots, so students and other attendees are expected to register online for some events.